Presiding Officer Norma Gonsalves joined with Nassau County Legislators Laura Schaefer, Michael Venditto, Denise Ford, Donald MacKenzie, Dennis Dunne Sr., and Rose Marie Walker, North Shore LIJ Chairman Dr. 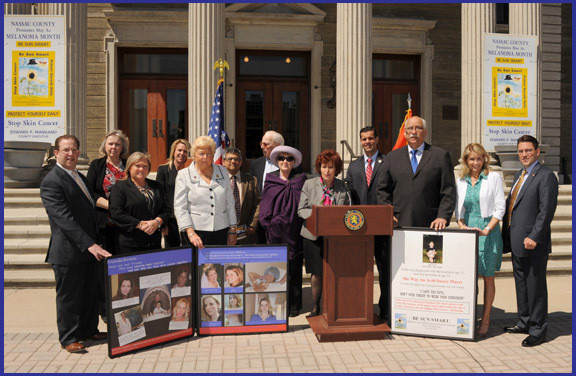 Omit Garg North Shore LIJ Senior Administration Director Holly Koehler, Nassau County Health Commissioner Larry Eisenstein, and the Colette Coyne Melanoma Awareness Campaign (CCMAC), to announce that May will be “Melanoma Awareness Month” in Nassau County. There are precautions that one can take to help avoid developing Melanoma. Sunscreen should be worn daily all year round, not just when going to the beach. Hats, sunglasses and protective clothing are important when being exposed to damaging UV Rays. Even the cloudiest day can have high levels of dangerous UV rays. Colette Coyne, founder of the CCMAC, also warned about the dangers of tanning beds. A recent study indicates tanning bed use by those under 30 increases their risk of melanoma by 75%. Few people realize that melanoma is the most common form of cancer in young adults from the ages of 20-35. The Colette Coyne Melanoma Awareness Campaign was formed in 1998 after Colette Coyne’s thirty-year old daughter died from skin cancer. The foundation’s mission is to raise public awareness about skin cancer/melanoma, while changing behavior towards excessive sun exposure. For more information on skin cancer prevention, contact the CCMAC at (516) 352-4227.